On gaining independence at the beginning of 1961, the Iraqi leader Abdul Karim Qasim immediately claimed Kuwait as the Nineteenth Province of Iraq. From a geostrategic point of view this move by Iraq was understandable. Kuwait sat as a cork in a bottle on the Shatt al-Arab, Iraq’s sole maritime border with the Persian Gulf. When Qasim was seen preparing his military to make good his word, Kuwait’s former protector Great Britain promised to guarantee the country’s sovereignty and moved an expeditionary force to Kuwait in order to deter a possible Iraqi invasion. Nucleus of this Operation Vantage was an aircraft carrier with escorts and a sizeable force of the Royal Marines with their helicopters and tanks in support Also, airborne infantry units were flown in. These provided a credible shield to prevent the modest Iraqi army to move southwards. 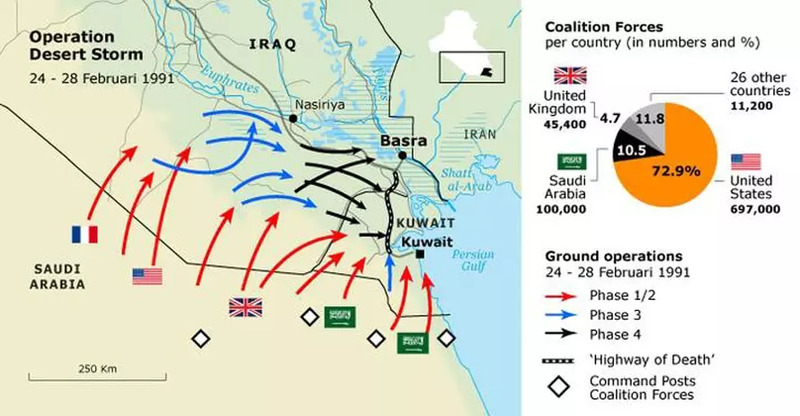 In a few months after the British force had very visibly dug in, the threat subsided with the recognition of Kuwait by the Arab League and the forming of a credible defensive force. The Iraqi threat subsided, but the Iraq’s strategic position remained. Ill-defined borders demarcations were settled in the years after independence. In the 1980s Kuwait saw itself quietly sucked into the conflict that raged between Iraq and Iran. Fearing a victory by Iran, the Gulf States provided Iraq with massive financial support. Kuwait also facilitated the export of Iraqi oil that was hampered by the closure of an Iraqi pipeline to the Mediterranean Sea by Iran’s ally Syria and the limited capacity of another pipeline through Turkey. In 1984, when Iraq had tried to obstruct Iranian oil exports by striking terminals at Kharq Island further down the Gulf, Iran retaliated by harassing Kuwaiti-flagged tankers carrying Iraqi oil. As of 1987 international navies escorted tankers to give them a safe passage from the terminals in the Gulf via the Strait of Hormuz to the markets in Asia and Europe. After signing an armistice with Iran in 1989, Iraq was left with a colossal debt – and substantial armed forces that had never been demobilized. In the course of 1990 tensions between Iraq and Kuwait rose as a result of Kuwait’s structural extension of its OPEC oil-production quotum – which had a negative effect on oil prices – and the alleged stealing of oil from a field spanning the border area. 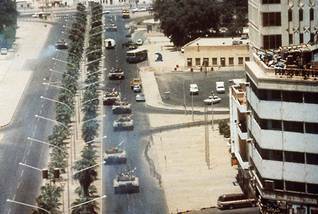 Tensions came to boiling point on 2 August 1990, when well-trained Iraqi Republican Guard units and heli borne troops quickly overpowered the small Kuwaiti forces that dared to put up symbolic resistance. Some Kuwaiti aircraft and army units – in total some 7,000 men – fled across the border to Saudi Arabia. An American-led international coalition was quickly raised in Saudi Arabia. It first formed a shield to prevent the Iraqi army from occupying the oilfields in that country and later was boosted to evict Iraqi occupiers from Kuwait. The Kuwaiti forces in exile participated in the ground offensive that unfolded on 24 February 1991. Earlier, the two dozen Kuwaiti Mirage and Skyhawk fighter bombers had joined in the air offensive that had lasted for six weeks. The army units had been merged in the so-called Martyr Brigade that was attached to the Joint Forces Command East, which combined units of several Gulf States. This force drove from the Saudi border towards Kuwait City, initially with the objective to draw Iraqi units away from the main axis of attack by coalition armoured formations that sliced through the south of Iraq towards Basra. 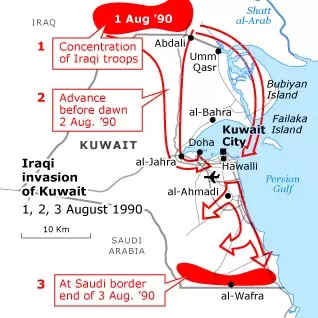 But resistance by the Iraqi forces in Kuwait itself proved less impressive, and the Kuwaiti forces were able to participate in the liberation of their capital. Only one Skyhawk was shot down, and one Kuwaiti soldier was killed in action. In September 1991 Kuwait signed a defence agreement with the United States, which built a series of bases and logistical facilities in the country. These bases proved an essential springboard for the mainly US-British forces that invaded Iraq in March 2003. No Kuwaiti forces participated in that offensive.